This is a series of 100 caches, in and around the Chilterns. Most of the footpaths are good, some good enough for buggies. Some of the bridleways are good enough for biking. I'll try to describe any obstacles along the way. But I can tell you, although I'm a keen biker, when the time comes to do maintenance of these caches, I'll be on foot. There are three osculating rings; you'll be able to walk any one of them, or all three. I've called it "The Chiltern Hundred" because there are, guess what, a hundred of them. This means that you can try to do them all in one day, and add your name to the roster of "100-a-day cachers". Email me if you achieve this, and I'll do a "Hall of fame" (let me know how long it took you). Actually, there's 109, because at any one time, I'd expect a few of them to be out of action. Or maybe a few you find too difficult. Caches are there to be found, so none of them are horribly difficult. You might need to scramble up a steep bank, stand on a stile, or get a few feet up into a tree. But my feeling is, if I can do it, anyone can - I'm not exactly athletic. I'm about six feet tall; if you're a lot less than that, you'll have to climb a bit further than I did. Most of the containers are 330 ml screw-top beakers. Some of them are somewhat smaller than that, about twice the size of a 35mm container, ok for small swaps, TBs and coins. Initially, I put in a very bright keyring torch, a finger torch (red, green, blue or white) and one other item. The third item is a compass, or a whistle/compass/thermometer, or a thermometer/compass, or an electronic mosquito repeller, or some other item. In each log book, there's a letter and a value. Obviously, you should note these down, in order to go for the Golden Bonus. The hides are mostly easy, although a few are up trees. There's no "pile of sticks" or "pile of rocks" hides. And there's very little ivy. None of the caches are micros. There's hints for all the hides; caches are there to be found. But some of them are cunningly hidden. Here's a map of the area, showing the location of the caches. This will help you plan your route. Bring a pencil. I didn't put pencils in any of the caches. A cacher without a pencil is like a fish without a bicycle. There's three Rings. 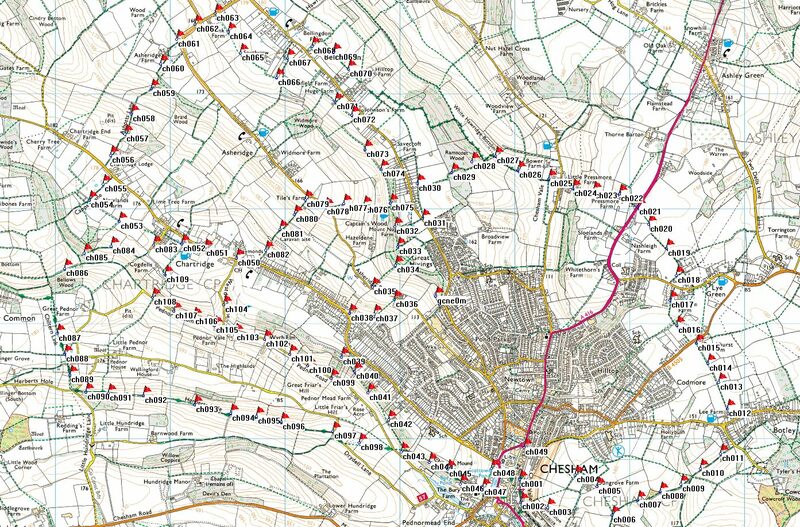 The largest (49 caches) is the Chesham Ring. The other two are the Asheridge Ring (33 caches) and the Chartridge Ring (27 caches). The Three Rings touch, each with the other two. So you can, in one roundwalk, do one, or any two, or all three Rings. In that scenario, it's the One Ring. Here's where you can leave one of the rings, spin round another, and then come back to the ring you were on before. You can start it anywhere, but the obvious place is at number one, which is near Chesham tube station. You can get there by travelling out along the Metropolitan line. If you come by car, there's a pay car park at the station, and a bigger car park down in Chesham, serving the supermarkets. There's also lots of free parking; for exmple, at N 51 ° 42.527 W 000 ° 36.529. If you want to start anywhere else around the ring, there's lots of places that I found to park. Just drive along a road, you'll soon find somewhere. You should be able to walk the whole Chesham Ring in less than ten hours. You should be able to walk the whole Asheridge Ring in less than six hours. Legend has it that if thirteen virgins walk round this ring in a single day, then the Gabriel will blow his trumpet and we'll all find out which religion we should have subscribed to. You should be able to walk the whole Chartridge Ring in less than four hours. You will need a pencil! You'll also need some paper, to record the letter values so that you can go for the bonus. Waterproof boots. The going isn't too muddy, but even if you think it isn't going to rain - hey, this is England. If your feet get wet, that will be substantially uncomfortable. You might even get blisters, painful toes, etc. Wet feet are not a good part of the experience. A spare pair of dry socks. Water. For drinking. There's a couple of pubs on the route, so some money might also be useful. If your mother tongue isn't English, take a small dictionary, you might need it for some of the hints. I know what you're thinking. You're thinking, if just one of these is muggled, I won't be able to do the bonus. No, I thought of that. I've done this a bit differently. I also get rather frustrated when I do a long series, but can't do the bonus because I couldn't find one of the caches. Muggling is sure to happen with at least one of these caches - there's so many of them! So, I've allowed for that. If you find enough (enough depends on how many are available and have bonus letters) of these 109 caches, you can go for the bonus. And there's no complicated formula to work out! All you have to do, is put the numbers you've gathered, into this form and it'll tell you the coordinates of the bonus cache. And please don't try to guess and guess and guess - the form won't let you make more than 24 attempts per day. Some people might need a wifi hotspot for this. You might try the Chesham Study Centre, but they're only open during certain hours, check their page for details. Elgiva Lane is at the centre of Chesham, a short walk from cache number 49. And what a bonus it is! It's a big ammo box, containing (initially) goodies such as a webcam, a big hard drive ... So make sure you bring along worthy trades for this Golden Bonus. One guy "Took hard drive, left a nice caching friendly pen on lanyard". That was a 300 gb hard drive traded for a biro. That's not what I would regard as a worthy trade. Not everyone can do it in one day. A few people have asked "Where can I stay in the area?". Trouble is, I live here, so I've never used any local B&Bs. If you do find anywhere to stay, even if it's barely adequate, please let me know. esscafe says "The B and B was just ok. and 40 quid so not the cheapest I have had but to be honest I couldn't find much around. It is right on the route which is good but I would not recommend it especially; however if anyone asks you about anywhere to stay then you could give them the number 01494-771029 at 1A Stanley Avenue Chesham. One other cacher from up north booked while I was there, the lady was trying to tell him about things to do and he said he just wanted to walk in 3 circles!" stagramblers says: "We stayed at a good self catering cottage and if people are interested it was off a letting agency www.letsunlimited.com which featured our cottage Bishopsfield, Wigginton. It even had Broadband!!! You said to let you know if we could recommend anywhere. Also the first time we came down we had a B & B (one room only) at Braziers Well, Braziers End, Nr Chesham, very good . Neither particularly cheap but its the area!" De Vere Venues in Chesham has a special deal for £19, but there may be special terms and conditions applying - check their web site carefully. I don't know how good it is there. We stayed their when we did the series and it was wonderful. The rooms were spacious and the facilities were excellent. The breakfast was 'all you can eat ' which is essential when facing a day of walking. There was free wi-fi as well. I think it is a conference centre during the week and so they offer discounted stays at the weekend. We stayed Friday to Sunday evening and noticed to new guests arriving on Monday morning armed with laptops suits etc. I would certainly recommend it to others. You don't want to check 110 pages just before you set off. So I'll list changes to the series here. 2008/08/17, CH044. I'd blundered on the coordinates, so I revised them. 2008/08/24, CH057. Cache was smashed; replaced in new position, moved substantially. New hint. 2008/08/25, CH046. Cache moved substantially, because of possible "Keep out" sign. New hint. 2008/08/25, CH005. Cache moved very slightly, because the old hide had disintegrated. New hint. 2008/08/31, CH002. Reported missing by several cachers, disabled. 2008/09/01, CH002. Replaced and re-enabled. 2008/09/01, CH097. Replaced temporary cache with permanent container. 2008/09/08, CH013. Replaced, new coords, new hint. 2008/09/08, CH017. Replaced, new coords, new hint. 2008/09/08, CH053. Replaced, new coords, new hint. 2008/09/12, CH102. Replaced, new coords, new hint. 2008/09/12, CH033. It was there, but replaced anyway, new coords, new hint. 2008/09/14, CH063. This one has gone AWOL, will replace. 2008/09/21, CH050. Coords updated with new readings, guidance added to cache page. 2008/09/28, CH063. This one has gone AWOL again, will replace. 2008/10/02, CH063. Replaced, with a different retrieval/replacement method. 2008/10/11, CH103. Disabled; I'll be relocating this one. 2008/10/12, CH103. Moved a bit, new hint, re-enabled. 2008/10/13, CH039. Disabled; I'll be relocating this one. 2008/10/13, CH039. Relocated, new hint, re-enabled. 2008/10/13, CH063. Checked after a report that it was missing. It's still there. 2008/10/18, CH052. Hint changed, because previous hide was destroyed. 2008/10/25, CH047. I have a report that this has probably been muggled. 2008/10/27, CH047. Replaced in a slightly different place, same hint. 2008/12/15, CH031. Cache is gone. I'll replace it. 2008/12/15, CH012. The log book is too wet, I'll replace it. 2008/12/17, CH012. Log book replaced. 2008/12/17, CH031. Cache replaced. Almost the same place. 2008/12/17, CH046. Cache replaced. New location, new coords, new hint. 2008/12/17, CH097. Cache replaced. Almost the same place. 2009/01/18, CH004. Cache disabled. Will be moved soon. 2009/01/18, CH005. Cache disabled. Will be moved soon. 2009/01/19, CH004. Wow, I found this cache in a *completely* different hide from where I left it! I've moved it a distance away, good to go now if you use the coords above. 2009/01/19, CH005. I couldn't find this cache at all. I've replaced it a distance away, good to go now if you use the coords above. 2009/02/25, CH079. Cache replaced, same coords, new hint. 2009/02/25, CH059. Cache replaced. Same coords, same hint. 2009/02/25, CH087. Cache replaced, same coords, same hint. 2009/02/25, CH048. Cache replaced, new coords, new hint. 2009/02/25, CH046. Cache replaced, same coords, new hint. 2009/03/02, Several logs replaced, CH023 checked (present and correct) Golden Bonus restocked. As of today, I believe that all the 110 caches are in place and ready to be found. 2009/03/14, CH030. Temporarily out of action. 2009/04/06, CH040. Cache replaced, slight move, new hint. 2009/04/14, CH063. Cache replaced, same place, same hint. 2009/04/14, CH075. Log book replaced. 2009/04/14, CH095. Cache replaced, slight move, new hint. 2009/04/14, CH096. Log book replaced. As of now, I believe that all the 110 caches are in place and ready to be found. 2009/05/01, BONUS. Cache replaced, completely new location, new hint. 2009/06/27, CH030. Cannot be retreived, I'll replace it. 2009/06/28, CH022. Replaced; slightly new location, new hide, new hint..
2009/06/28, CH030. I replaced it. 2009/06/28, As of this date, I believe that all caches are operational. 2009/07/10, CH075. Temporarily replaced with a 35mm micro. 2009/07/19, CH063. This one has gone AWOL again, will replace. 2009/08/10, I replaced the logs on the whole of the Chesham ring (numbers 1 to 49) except 43 and 45. I also put a red Dymo label for the clue letter-and-value on the lid and body of each cache. 2009/08/10, CH038. Coords slightly revised after I took a new reading. 2009/08/10, CH049. Cache replaced, new location, new hint. 2009/08/11, I replaced the logs on the whole of the Asheridge ring, 50 to 82. I also put a red Dymo label for the clue letter-and-value on the lid and body of each cache. 2009/08/11, CH109. Cache moved, hint changed. 2009/08/11, CH075. Cache moved, hint changed. 2009/08/12, I replaced the logs on the whole of the Chartridge ring, 83 to 109. I also put a red Dymo label for the clue letter-and-value on the lid and body of each cache. 2009/08/12, Maintenance is now complete; all caches ready and waiting. 2009/09/03, CH050. Difficulty level changed to four. 2009/09/26, CH041. Disabled, will be moved. 2009/09/30, CH050. Cache replaced where it is supposed to be. Clue modified to clarify. 2009/09/30, CH007. Cache replaced in new location, new hint, re-enabled. 2009/09/30, CH041. Cache replaced in new location, new hint, re-enabled. 2009/09/30, CH109. Cache replaced in new location, new hint, re-enabled. 2009/09/30, Maintenance is now complete; all caches ready and waiting. 2010/03/11, CH001, replaced in new position, new hint. 2010/03/11, CH010, log book replaced. 2010/03/11, CH011, replaced in same position. 2010/03/11, CH033, replaced in same position. 2010/03/11, CH034, log book replaced. 2010/03/11, CH039, replaced in same position, new hint. 2010/03/11, CH045, replaced in new position, new hint. 2010/03/11, Maintenance is now complete; all caches ready and waiting. 2010/11/04, CH022, replaced in new position, new hint. 2010/11/04, CH039, replaced in new position, new hint. 2010/11/04, CH041, replaced in new position, new hint. 2010/11/04, CH052, replaced in new position, new hint. 2010/11/04, CH109, replaced in new position, new hint. 2011/04/04, CH046, replaced in new position, new hint. 2011/04/04, CH002, replaced in new position, new hint. 2011/04/04, CH013, replaced in new position, new hint. 2011/04/04, CH015, replaced in new position, new hint. 2011/04/04, CH052, replaced in new position, new hint. 2011/04/04, CH102, replaced in new position, new hint. 2011/04/04, CH103, 35mm replaced by tub. 2011/04/04, CH104, replaced in new position, new hint. 2011/04/04, CH089, nibbled container replaced. 2011/04/04, maintenance complete, all caches ready and waiting, although some might need a replacement log. 2011/05/29, CH102, replaced in new position, new hint. 2011/05/29, maintenance done, all caches ready and waiting (CH47 missing it's code number).